Part – some would say all – of the excitement of exploring a new city is rooted in the thrill of surprise. There’s nothing quite like the feeling of discovery, of treading streets which are familiar to countless previous visitors and inhabitants, but which feel completely new to you. And if you find yourself wandering up Nottingham’s Victoria Street, you’ll find yourself astonished in all the right ways when you encounter the Pit and Pendulum, lowering mischievously behind a suitably brooding facade. 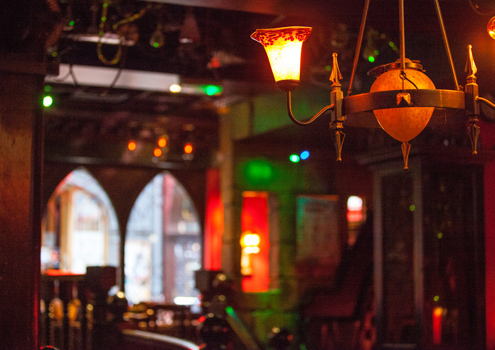 Part of the Eerie Pubs group – which has spread its cadaverous fingers across the UK, from Aberdeen to London – the Pit and Pendulum is the kind of easygoing rock-Goth-grunge bar you like to think you’d have gone to when you were an angsty teen. The guitar-music backdrop is loud enough to enjoy, but won’t drown out a conversation. The “spooky castle” decor (complete with grotesques, chandeliers and alchemy apparatus) treads a fine line between moody drama and knowing, nudge-wink camp throughout this sprawling venue. And it’s dark enough to be atmospheric without making you fall down the stairs. Fundamentally, though, the Pit and Pendulum is a damn fine eating and drinking establishment. There’s an excellent choice of bottled beers and cask ales, not to mention all the spirits and cocktails you’d care to mention. Meanwhile, a surprisingly extensive food menu runs the gamut from light snacks to full meals, making this a hostelry catering for all appetites. It’s tasteful, it’s tasty, and it’s absolutely brimming over with character. Whether you’re fortunate enough to be able to visit regularly, or only have chance for a single swift pint (if the Titanic Porter’s on draught, it comes highly recommended), the Pit and Pendulum is the kind of pub you feel a whole lot richer for having visited. And besides, any alehouse that hides its toilets behind a false wall in the library has got to be worth a look, hasn’t it?